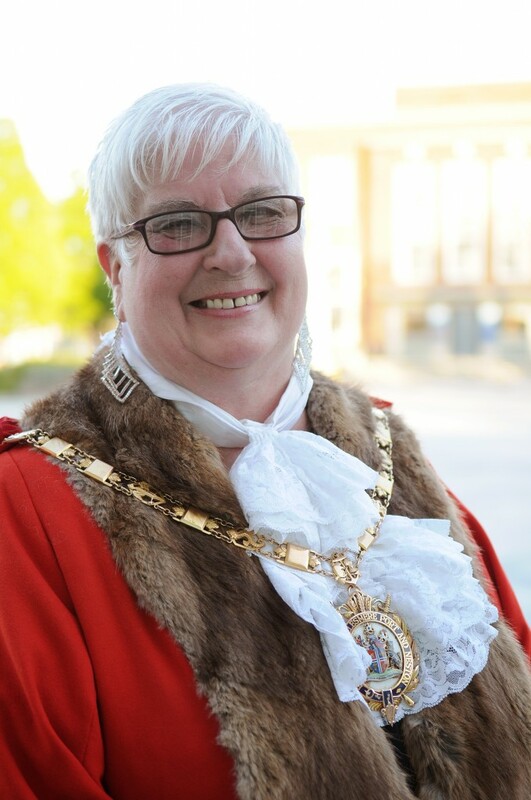 21 May 2015 – The new Mayor of Ellesmere Port is Councillor Lynn Clare who was born and brought up in the Wolverham area of the town. She joined the Royal Navy at 17, stayed in the service until her marriage in 1968 and lived in Singapore until 1973. When Councillor Clare returned to the UK she lived in Plymouth, then Poole before returning to Ellesmere Port. She worked for a local MP from 1992 until 1997 and during that time she established the charity Parents Against Drug Abuse (PADA). She continued to work for the charity for 15 years and was awarded an MBE in 2004 for this work. She became a Councillor in 2006, again in 2011 and has since been elected for a third term on Cheshire West and Chester Council. Councillor Clare was Mayoress of Ellesmere Port when Councillor Pat Merrick was Mayor in 2012/13. Councillor Clare’s Mayoress is Jenny Bateman whose late husband Derek was a Deputy Leader, Council Leader, Father of the Council and Leader of his political group on the former Cheshire County Council, and leader of his group during their time in opposition on Cheshire West and Chester Council. Councillor Clare said: “As I now stand as a Councillor in Derek’s old ward, and he was so helpful to me in my early days of being a Councillor, I thought it was time that Jenny got the chance to be Mayoress. “I feel deeply honoured to be Mayor of my home town. “I want this Mayoralty to reflect the goodness of our community in Ellesmere Port and therefore charitable giving – whilst having some fun – will be central to my term in this great office. “I have thought long and hard to decide the charity for which I .want to raise funds. “Most families I know are touched in some way by cancer and for that reason I want to raise monies for a cause that not only helps cancer sufferers, but supports their friends and families too. The Deputy Mayor of Ellesmere Port is Councillor Myles Hogg who has been a Councillor for 28 years, representing Willaston and Thornton for 20 of them. He was Mayor of Ellesmere Port and Neston in 2002/2003 and has been a Governor of The Whitby High School for 27 years and Chair for 12 years. He is Governor of Childer Thornton Primary School and also West Cheshire College. Councillor Hogg is a Chartered Accountant and is married to Marilyn with three grown up children and eight grandchildren. He has lived in Willaston since 1985 and his hobbies are gardening and playing bridge.